H & C SEYMOUR FARMS INC. Directions: Being on Hwy. 11 north of Kinston, take Hwy. 55 east for 1 ½ miles, turn left on Faulkner Rd., go 1 ½ miles, sale on right. Watch for auction signs. TRACTORS, BACKHOE, COMBINE, TRUCKS, TRAILERS. 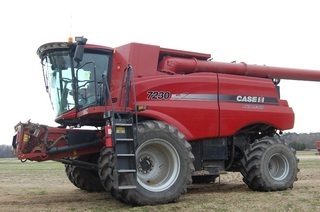 Case IH 275 MFWD, SN29R202651, powered by 275 hp, 6-cyl. diesel, power shift transmission. 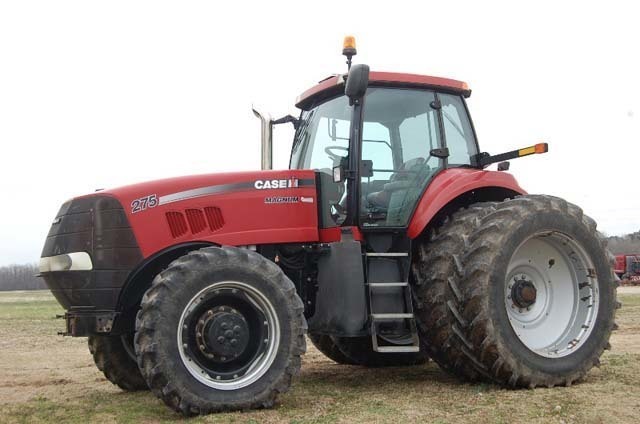 Case IH 7140 MFWD, SN-JJA-0030203, powered by 216 hp 6-cyl. 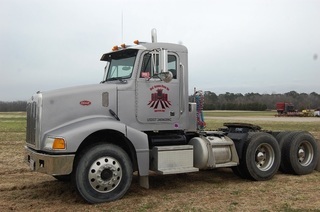 diesel, power shift, transmission, differential lock, 1000 shift-on-the go pto. (3) sets dual remote hydraulic outlets, 16.9R28 front tires, 20.8R-42 rear tires, 8508 hrs., Trimble FM1000, auto steer. Case IH 7140 MFWD, SN JJA0024141, powered by 216 hp, 6-cyl. diesel, power shift transmission, differential lock, ps, 540 shift-on-the-go pto, (3) sets dual remote hyd. outlets, cab, 16.9R26 front tires, 20.8R38 dual rear tires. 8198 hrs. Case IH 5240 MFWD, SN JJF1058860, powered by 111 hp,6 cyl diesel, standard transmission, w/ left hand shuttle shift, differential lock, 540/1000 shift-on-the-go pto, (3) sets dual remote hyd. outlets, cab. 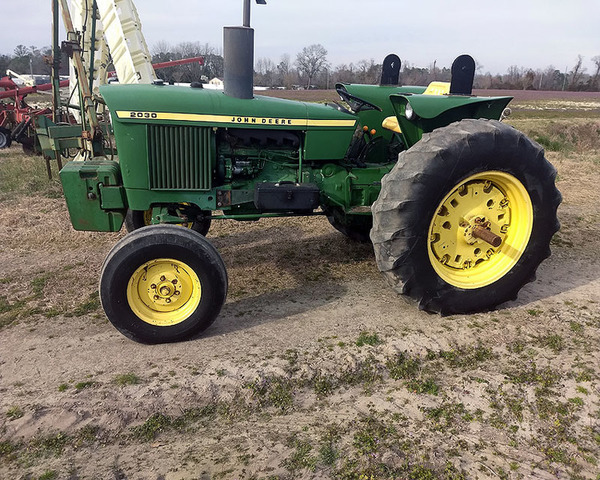 13.6R36 front tires, 14.9R46 dual rear tires, 7400 hrs. Case IH 5130, SN JJF1017210, powered by 99 hp, 6 cyl. diesel , standard transmission, differential lock, 540/1000 shift-on-the-go pto, (2) sets dual remote hyd. outlets, cab, 10.00-16 front tires, 18.4 R38 rear tires, 8985 hrs. Case IH Farmall 80 MFWD, 4 cyl., diesel, standard transmission, differential lock, 540 shift-on-the-go pto, 2 sets dual remote hyd. outlets, ,2 post roll-guard, canopy, 12.4R24 front tires, 18.4 R30 rear tires, 1339 hrs. IH 674 Tobacco Special , powered by – hp, 4- cyl. diesel, standard transmission, differential lock, ps 540 shift-on-the go pto, set dual remote hyd. outlets, 7.50-16 front tires, 18.4-30 rear tires. Cub Cadet The Tank lawn mower. 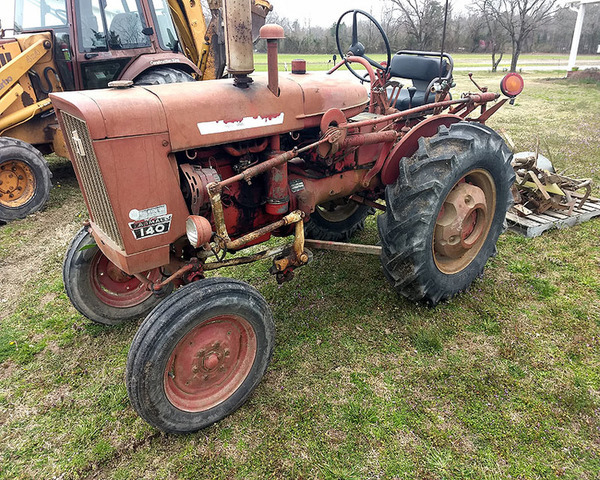 Farmall Super C , 3-pt. Farmall Super A w/belly mower. Case 590 backhoe, 4×4, cab, 90” 4-N-1 loader bucket, 24” digging bucket, 1532 hrs. 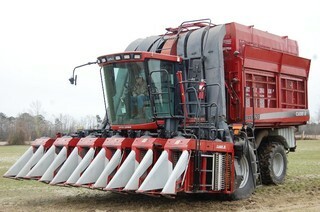 2010 Case IH 2162 35’ draper head, SN- YAZN13340. 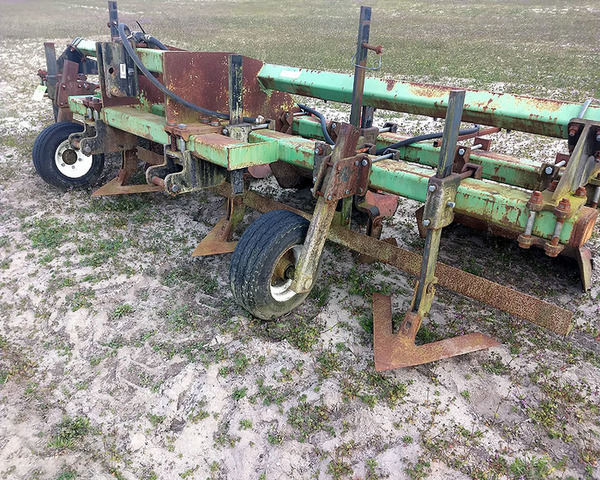 Unverferth HT 25 header cart. 1996 Volvo daycab road tractor, Cummins N14 engine, 9- speed. air brakes, 27.5 aluminum Budds, live tandem, sliding 5th wheel, 168” wheelbase, 26427 miles, air ride suspension. 1986 Freightliner daycab road tractor, Cummins 350 Big Cam engine, 9- speed, west coast mirrors, 22.5 Budds , (2) 125 gal. fuel tanks, live tandem, sliding 5th wheel, 158” wheel base, 277,793 miles. 2000 IH 4900-10 -wheeler, DT466 engine. Diesel, 6- speed, air brakes, west coast mirrors, 22.5 tires, 24’ body, 242” wheel base, 173,770 miles, Hendrickson suspension. ‘70 Chevrolet C50, 8 cyl gas, 4 speed, 16’ dump, west coast mirrors, 8:25-20 Budds . 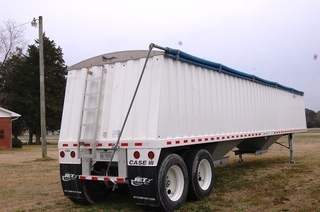 1987 Fruehauf 34’ aluminum frame dump, 50” sides, 22.5 Spokes, 2- way gate, roll tarp. 1998 Great Dane 53×102 van trailer, swing out doors, 22.5 Budds, sliding tandem. Trailmobile 45’ van trailer, for storage. 2004 Case IH CPX620 6-row picker, 4×4, SN-Y5T010511, 6-cyl. 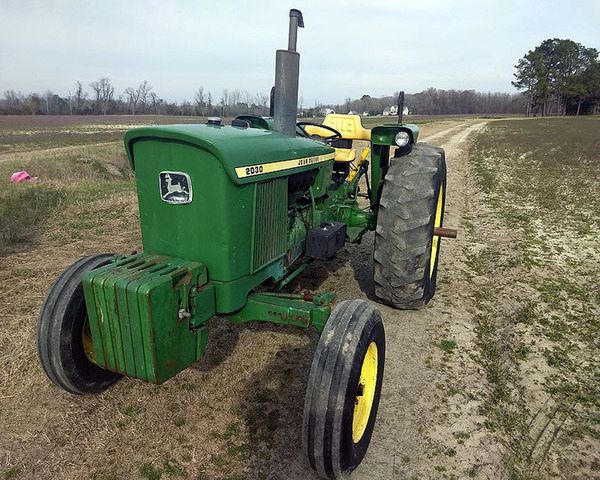 diesel, 860 fan hrs., 1428 engine hrs., 500/9503Z Duals. Case IH 2555 4-row picker, 4×4, SN-JJC0156954, 2800 fan hrs., 4281 engine hrs. Case IH 2055 4-row, 4×4 (for parts). KBH 16’ boll buggy, 2 5/16 ball hitch. (2) KBH modular builder, (1) auto bridge. (11) Roanoke Hemp drying structures, fully insulated. AC 4-cyl. gas irrigation pump w/ Carter 44 hp engine. Hale PTO Pump w/hydraulic driven primer, 3-pt. Approx. 2000’ Shur Rane 5” irrigation pipe. Approx. 2000’ Shur Rane 4” irrigation pipe. Sheppard 4-row stalk chopper, front mount. Krause Mdl. 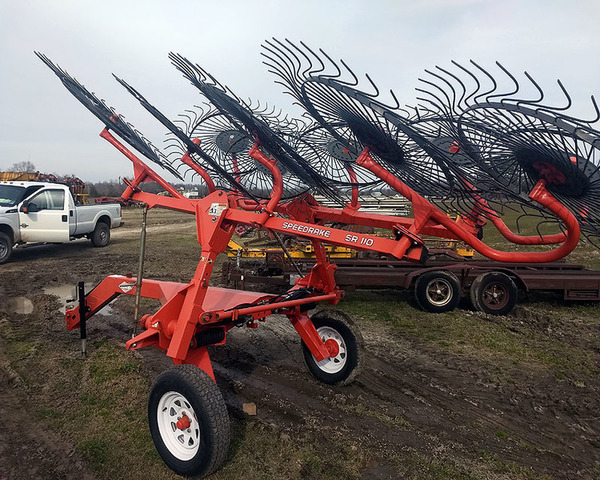 7300, 27’, 72-blade hydraulic fold disc, 9”spacing, Remlinger rolling basket. IH, Mdl. 475, 21’, 46-blade hydraulic fold disc, 9”spacing. 8’ disc, new blades, 3-pt. Case IH, Mdl. 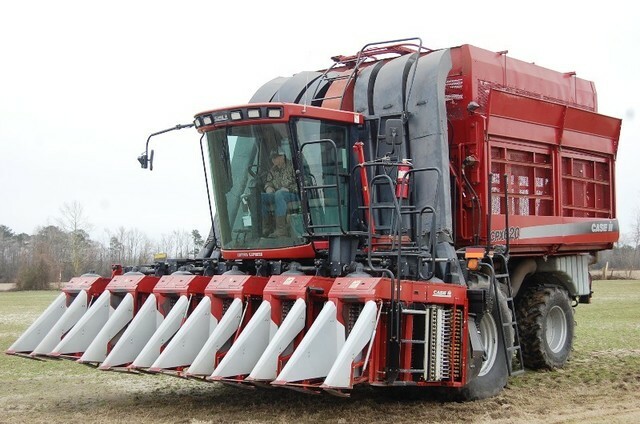 335VT Turbo Till, 27’, tandem wheels, hydraulic driven pressure on baskets, SN-FD080307. 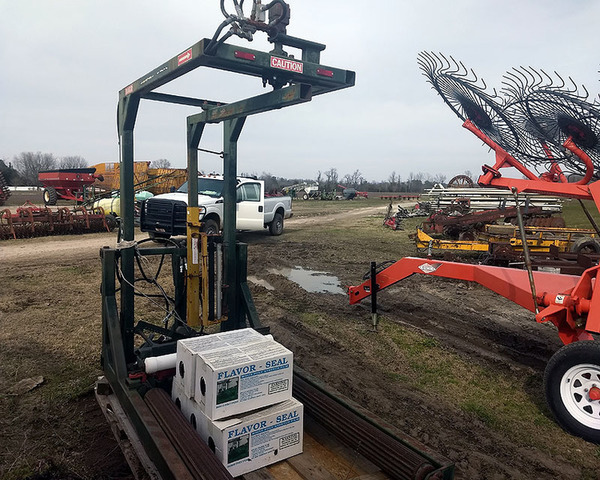 KMC 20’ hydraulic fold field cultivator, double rolling basket, new points, 3-pt. 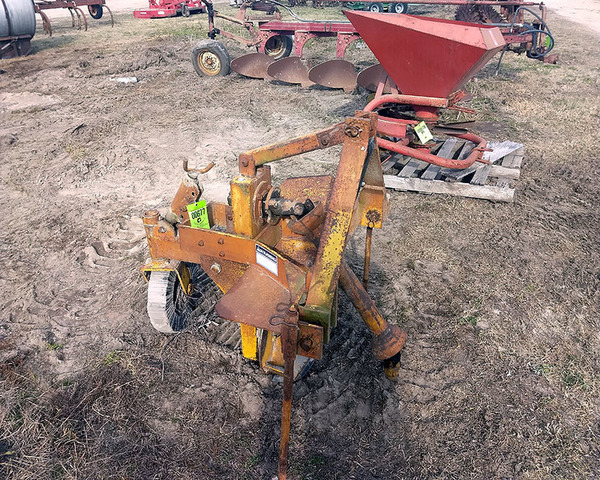 IH 13’ rotary hoe, 3-pt. Bush Hog 4-row rolling cultivator w/KMC fertilizer attachment, set on 48”, 3-pt. Case IH 8-row Danish tine cultivator, hydraulic fold, 3-pt. 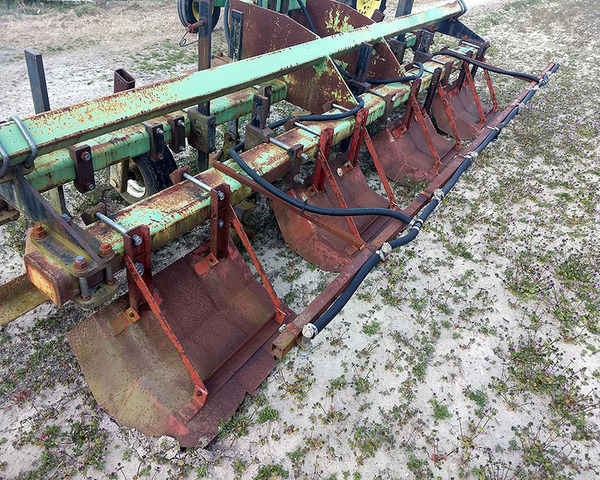 IH 13-tine chisel plow, 3-bar, 3-pt. Bigham Brothers 4 shank ripper, partial, 3-pt., auto reset. IH 9-shank chisel, 2-bar, 3-pt. Unverferth 8-row strip till, auto reset shank press wheels, hydraulic field row markers. 2014 Case IH 1235, 12-row stack fold planter, cable drive, row clutches, row cleaner, pneumatic down force, in furrow 2×2, set on 36”, planted 1 season, planted only 700 acres. Great Plains 2025P, 20’ planter, 16-row , no-till, w/corn meters, 16-15 or (8) 30”, hydraulic row markers, 3-pt. 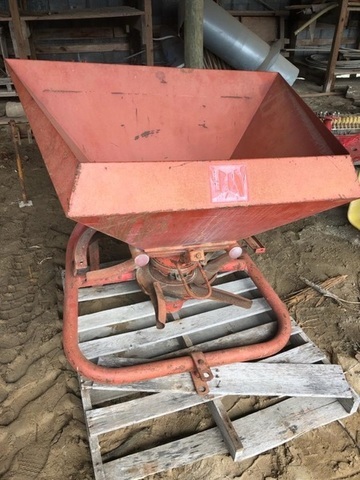 Case IH 5000 20’ caddy cart, pull type. 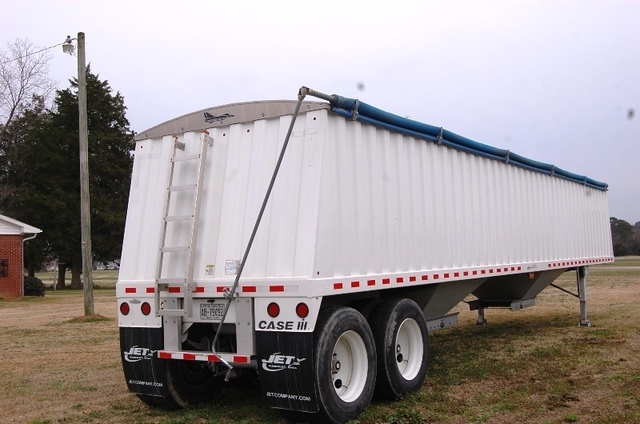 Meridan 242 RT seed express tender, tandem axle, 16” tires, Honda engine, roll over tarp, pin hitch. Montag 6-ton, 12-row hydraulic driven, variable rate seed/fertilizer hopper. Montag 8-row variable rate fertilizer applicator, set up for GPS variable rate. Red Ball 655 sprayer w/Boyd Ag hydraulic fold aluminum 80’ booms. 3-pt. 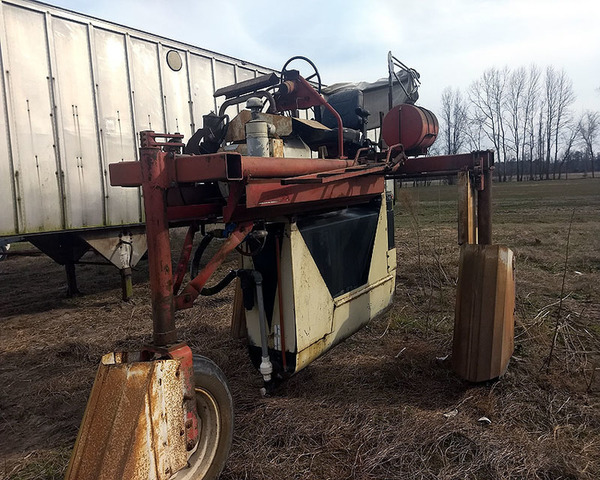 Sheppard 26’ hooded sprayer, hydraulic fold, 3-pt. Red Ball hooded sprayer, 60’. 12-row hooded sprayer, hydraulic fold, 3-pt. Coastal 300 gal. 12-row lay by rig, hydraulic fold, 3-pt. Sheppard 150 gal. 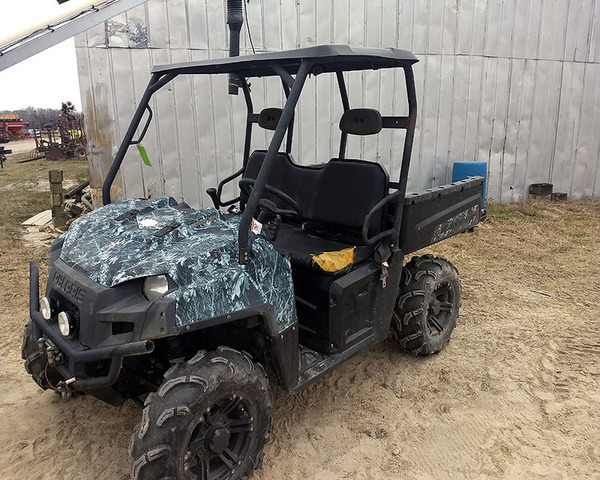 ATV sprayer, 38’ booms, Honda engine, pull type. Sheppard 3250 gal. nurse tank w/B&S pump, tie down bands. Sheppard 2000 gal. poly tank nurse tank w/Honda pump. Reddick 250 gal. saddle tank, horizontal mount, last on 275. (2) 3000 gal. flat bottom nurse tanks. (5) Sheppard 300 gal. front mount tanks. Butler 1060 grain auger, 60’, 10”, w/swing auger for hopper bottom, 540 pt. 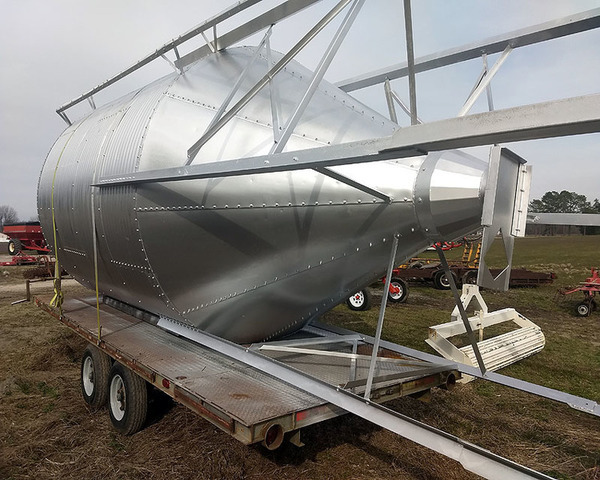 Hog Slat 4-ton hopper bottom feed tank. Unverferth 6500 grain cart, 1000 pto, roll over tarp, pull type. Clipper #27 seed cleaner, very good. Bush Hog 13414 rotary cutter, 1000 pto, mulching package, 3-pt. Hardee Mdl. 1198W rotary cutter, 8’, 540 pto, 3-pt. Hardee DB 4060 hydraulic ditch bank mower, hydraulic slide, 540 pto, 3-pt. 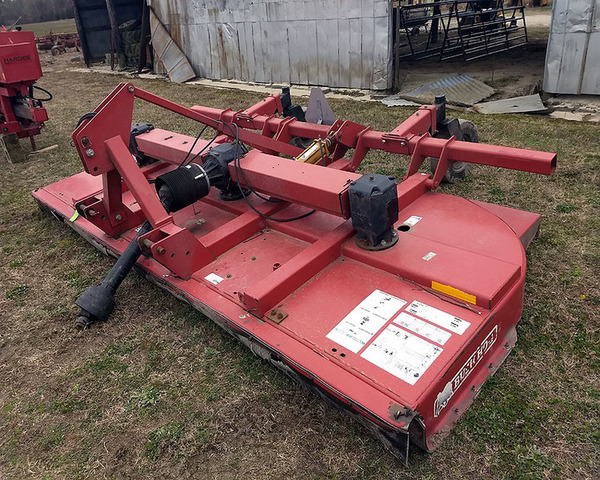 Hardee H-20160-C hydraulic long arm mower, 540 pto, 3-pt. Reynolds 5C 5yd. 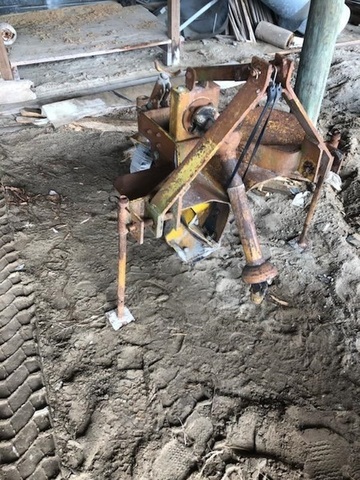 hydraulic dirt pan, hooks to tractor drawbar. Amco inline ditcher, 540 pto, 3-pt. 12’ box blade, pull type. Red Ball 420, 8-row tool bar, hydraulic fold. 5600 gal. vertical fuel tank. 150 gal. fuel tank w/battery operated pump. L-shaped fuel tank w/battery operated pump. Thunder Creek 50 gal. DEF transfer tank, battery operated. (8) Bush Hog 13414 prep master rollers, basket, choppers. 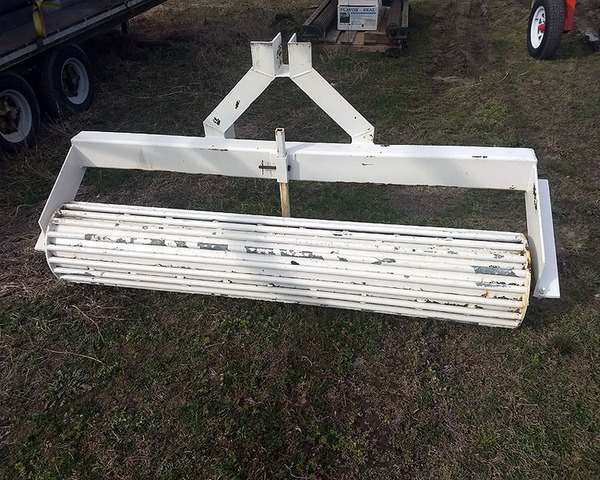 Case IH stock fold too bar, 30’, 3-pt. (been hot). (2) 10”, 10-bolt wheel spacers. 7” 8-bolt spacers, last on 5240. 15” 10-bolt front dual spacers. Unverferth lift assist, brand new. (2) Air operated grease pumps for cotton picker. Case IH 620 transmission & tower drive. 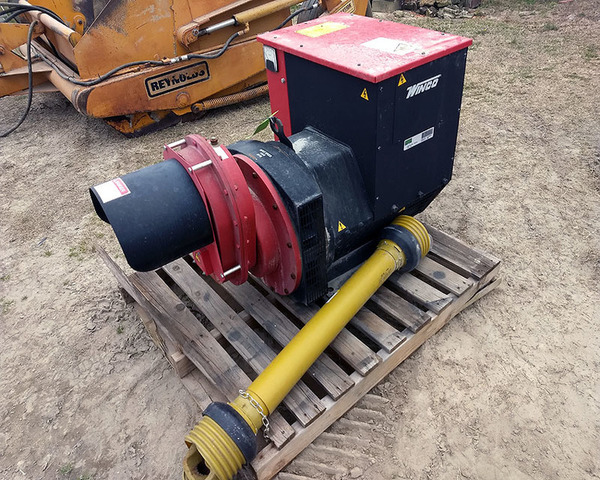 Winco 150 KW geneator, 1000 pto. Ingersoll Rand 30 gal. air compressor w/Honda engine. Hobart welder/generator 10,000 watt, Kohler engine. John Bean Brake lathe machine. Leven metal lathe, thread & aper. Supply Cabinets – electrical terminal roll pin screws. Grease fittings , battery terminals. Polaris Ranger 700 motor needs work. 14.5 tires, new, on rims. 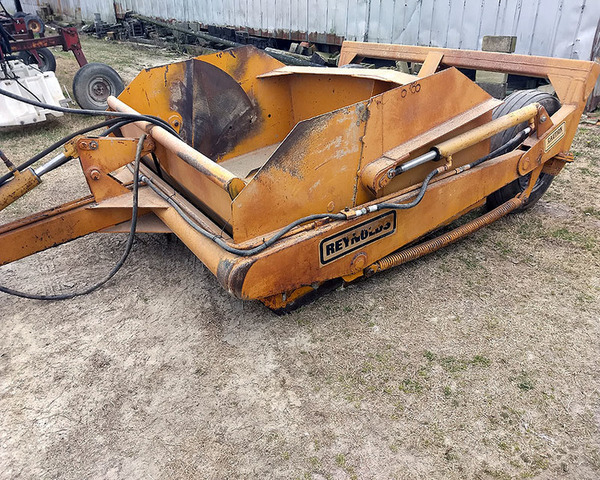 Auctioneer’s Note: Seymour Farms is having a complete liquidation of their farm equipment. Other than a few early vintage pieces, 70% has been shed kept. Be here sale day & take home equipment to last you a long time. For More Info text or call Chris 252-560-6699.